Myth #1. Puppies are better than adult dogs – especially if I have small children. Truth #2. Another untrue myth that leads to much disappointment and disillusionment among dog owners. Female dogs, like female humans, are no more likely to be meek or docile than their masculine counterparts. In fact, female dogs are commonly more alpha than their male counterparts. They are certainly not to be underestimated. (Just like human females, eh?) Male dogs can be just as laid-back and mellow as female dogs – perhaps more so, if they have been properly neutered – and female dogs can be very alpha. Truth #3.No, what's actually inhumane is subjecting a dog to the perils of breeding, and all the health risks that go with not altering your dog. In addition, bringing a litter of puppies you are unable to healthily cope with into the world is not fair. Millions of “purebred” dogs die in shelters every year. Not only does spaying and neutering drastically reduce the risk of violence and aggression in your German Shepherd dogs, but it also protects both you and your pets from the risks of more homeless puppies and dogs in this world. Furthermore, dogs that are neutered are more pleasant companions, happier dogs. Spaying or neutering your dog puts them at diminished risk for many related illnesses. Spay your dogs, and be a part of the solution, not the problem. 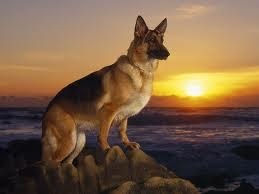 Before you breed your dog, go walk an animal shelter or check out our website www.gsroc.org.